The Club Meeting of November 18, 2005. Mark presented his slide show and video; the club was not disappointed. Mark is best known for his comet observing. During the meeting, the club president Charlie Nielsen presented Mark with the Astronomical League’s Comet Observers Gold Level award. I want to thank everyone who showed up and I hope you all enjoyed the presentation as much as I did preparing and giving it. A lot of work went into making it both entertaining and informative. 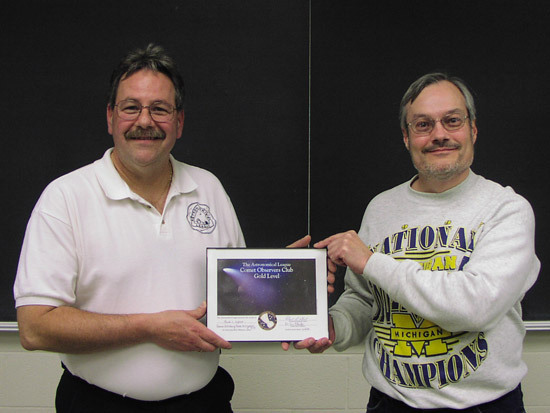 Thank you, Charlie for presenting the Astronomical League’s Comet Observers Club Gold Level award to me. 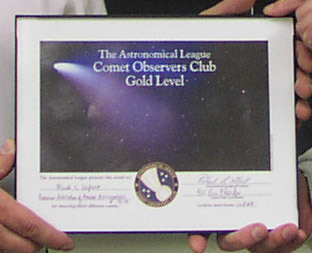 For those of you interested, this award is given to any Astronomical League member who observes (visually or photographs), 30 different comets. Those observations must be documented in standard observing log format, and either sketched or photographed, and submitted to the Comet Club’s coordinator for verification. I completed these requirements at the 2005 Black Forest Star Party when I logged my 30th and 31st comets. As of November 1st the award has only been given to 5 other very experienced observers. As a side note; I am currently in pursuit of the first “Double Gold” (60 different comets) award. This award doesn’t really exist at this time, however the coordinator did say that if I can bag an additional 29 different comets he might just consider creating the award. If you have any comments about the video that I showed last night please forward them to me, so I can pass them on to Samuel Ettaro who helped put the video together. If you want more info on the Astronomical League’s Comet Observers Club or any of the other programs they have, here is a link: http://www.astroleague.org/al/astrnote/astnot25.html . All photographs on this page were taken by Dave Snyder.